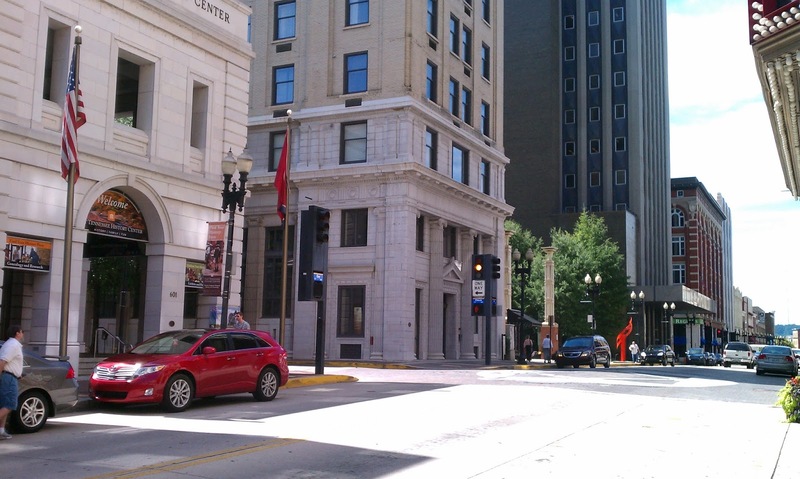 Here we find ourselves standing on the eastern sidewalk of the 600 block of Gay St. looking northwest, through the Clinch Avenue intersection, to the western side of the 500 block. Oh, how much has changed since this shot from the 1920's! On Gay Street itself - the street cars are gone, as are the platforms and the traffic tower. Now, from left to right. 1) The 1875 building and then the Fouche block have both been replaced by the East Tennessee History Center. 2) Holston National Bank is still there, but it is now the Holston, a condominium development. Hanover Shoes and Wormser Hat Shop; the Fred Breeden Barber shop and Economy Drugs and Tea Room; Hope Gift Shop along with the Hope Bros. clock; O'Neils Cafe; and the Queen Theatre have all been replaced by the Krutch Park extension. 4) The last two store fronts on the block, Woolworths 5 & 10 and the 4 story Park National Bank were replaced in 1974 by the new 13 story Park Bank Building (now the William F. Conley building). Interstingly, this building was built in two halves. The Woolworths half (southern) was built up to the top floor with the old Park building still standing. When they finished that half, they moved the bank into the new part, tore the old Park building down, and built the second half. 5)The next block shows the Miller's building still standing. It went through a period where it was hidden by sheet glass, but it is restored and back in its former glory. The 1935 art deco addition had not yet been built in the earlier photo. Other than the street lamps, do you notice any other changes? Although I didn't notice at first, you are looking through the Clinch intersection at "the 500 block" of Gay, not the 700 block of Gay. You are absolutely correct and a total slip of mind on my part. I have an office at 507, so for whatever reason my mind wrote 7 hundred instead of 5 hundred. The traffic tower went away, too!